Article by Andrew Rettman for EUOBSERVER, reprinted in full below. See also “A shameful investment in a dystopia“. The Greek government plans to build a wall along its 206-km-long land border with Turkey to help keep out unwanted migrants on the model of the US border with Mexico. “The Greek society has reached its limits in taking in illegal immigrants … We are absolutely determined on this issue. Additionally, we want to provide a decisive blow against the migrant smuggling rings that trade in people and their hopes for a better life,” he added. Mr Papoutsis compared the planned construction to the 1,050-km-long fence running through sections of Arizona, California, New Mexico and Texas on the Mexico-US border. Built at a cost of €1.8 billion over the past five years and backed-up by cameras, radar surveillance, jeep-mounted patrols and predator drones, the 4.5-metre-high metal wall initially raised howls of protest on humanitarian and environmental grounds, but has since gained widespread public support in the US. The EU and Turkey have not reacted to the Greek plan, even though it has the potential to cause upset. The Union frequently voices complaints against Israel’s anti-Palestinian wall, while slow progress in EU-Turkey accession talks and historic Greek-Turkish tensions could see the new barrier become a symbol of EU antipathy toward its southern neighbour. For its part, the European Commission in mid-December said it will extend until March its Rabit (Rapid Intervention Border Teams) mission and spend €9.8 million over the next six months on easing conditions in Greek migrant detention camps and on sending asylum and migration consultants to Athens. The Rabit mission consists of 175 armed guards sent from 25 EU member states under the command of the Union’s Warsaw-based Frontex border control agency. Greece is the main entry-point into the EU for irregular migrants from Africa and Asia. Noting the impact of the Rabit intervention, Brussels said that 7,586 people were intercepted on the Greek border in October prior to its deployment, compared to 4,270 in November after it was put in place. EU home affairs commissioner Cecilia Malmstrom in a statement on 15 December called on Athens to improve conditions in its detention centres, which were described as “inhuman” and “degrading” by the UN and by Amnesty International late last year. “The Greek authorities are benefiting from European solidarity through a package of financial and practical assistance and I urge them to put all necessary measures in place to assist the persons in need,” she said. The original text of this article is available here. Europe’s leading drone manufacturers have joined forces in yet another EU-funded R&D project on the development of unmanned aerial vehicles (UAVs) or ‘drones’. The OPARUS project brings together Sagem, BAE Systems, Finmeccanica, Thales, EADS, Dassault Aviation, ISDEFE, Israel Aircraft Industries and others to “elaborate an open architecture for the operation of unmanned air-to-ground wide area land and sea border surveillance platforms in Europe”. The consortium has received €11.8 million in EU funding. Meanwhile IPS reports that FRONTEX has invited expressions of interest in a tender to demonstrate “Small UAVs (Unmanned Aerial Vehicles) and Fixed systems for Land border surveillance”. Another article, by Dave Cronin, reports that the European Defence Agency (EDA) has now launched the SIGAT project (Study on the Insertion of UAS in the General Air Traffic), featuring EADS, Sagem, BAE and Dassault (see also previous post on the EDA’s drone programme). Finally, Cronin’s article also notes that Sagem has entered into a “joint venture” with Elbit, the Israeli company which manufactured some of the most lethal weaponry ever used in Gaza. The FP7 programme is supposed to be about implementing the ‘Lisbon strategy’ and making the EU the “most dynamic competitive knowledge-based economy in the world”. According to the Commission: “The ‘knowledge triangle’ – research, education and innovation – is a core factor in European efforts to meet the ambitious Lisbon goals. Numerous programmes, initiatives and support measures are carried out at EU level in support of knowledge”. This includes the European Security Research Programme, which has just awarded Selex (a Finmeccanica company) a €10 million ‘research’ contract to develop an EU sea border surveillance system (the total project cost is €15.5 million, the EC contribution is €9.8 million). 3) develop and demonstrate significant improvements in detection, tracking, identification and automated behaviour analysis of all vessels, including hard to detect vessels, in open waters as well as close to coast. c) struggling [sic] illicit activities in open-sea in the Atlantic waters from Canary Islands to the Azores; in coherence with the EU Integrated Maritime Policy, EUROSUR and Integrated Border Management, and in compliance with Member States sovereign prerogatives. In 2009, Finmeccanica revenues were somewhere in the region of €18 billion, of which 12% (approx €2.16 billion) was reinvested into Research and Development. Finmeccanica’s annual R&D budget is thus more than 10 times the annual budget of the entire European Security Research Programme. Finmeccanica has already established itself as a global, market-leading provider of Homeland Security and maritime surveillance systems, as demonstrated by recent contracts with Libya and Panama (among others), each worth hundreds of millions of Euros. This begs the obvious question of whether EU R&D subsidies for the likes of Finmeccanica are really warranted, and whether this kind of contract is strictly in accordance with FP7’s ‘knowledge triangle’ of research, education and innovation. In reality the SEABILLA project has very little to do with innovation and everything to do with procurement. The EU is already committed to developing the kind of high-tech surveillance systems that only the defence sector can deliver [on maritime surveillance, see pages 36-40 of the NeoConOpticon report] but it lacks the mandate, budget and office to procure the requisite expertise, software and hardware. Of course, were the EU to attempt to fulfil its ambitions by establishing a European Department of Homeland Security, there would be fierce resistance among the member states, not to mention civil society groups and a reluctant public. What we have instead is an unaccountable EU procurement strategy – masquerading as research – committing hundreds of millions of taxpayer Euros in ‘seed money’ to security apparatuses that pre-empt both the political and legal authority needed to put them into practice. It’s certainly innovative, but is it the kind of innovation that the architects of the FP7 programme had in mind? 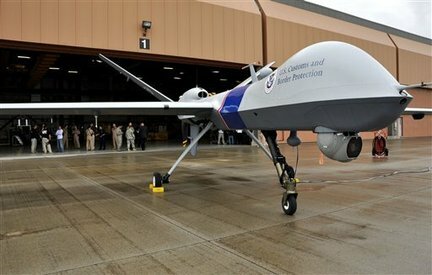 Entire US-Mexico border to be guarded by Predator Drones: Europe to follow suit? Starting in September, the entire 2,000-mile US-Mexico border will be monitored by drones, the Christian Science Monitor has reported. The EU is headed the same way. Subject to drone manufacturers and operators getting clearance from European air traffic controllers, the EU’s borders could be buzzing with UAVs within a few years. Not that any of this is being debated by, for example, the European parliament.